Teenagers often have to manage dual identities. On one hand, they have to do well in school to please their parents and teachers; on the other, they have to wear the right clothes, drive the right cars, and go to the right parties to please their friends. Teenage girls often have the added pressure to look a certain way in order to conform and gain popularity among their peers. As a result, teenagers often look at celebrities as role models, even though their teachers try and encourage other role models, like the characters of classic literature. Yet, Marvel’s new comic series has a strong female protagonist who is worthy of recognition as well: Kamala Khan. As a teenage superhero, Kamala struggles to balance her family’s expectations with fitting in at school and fighting the bad guys, yet through it all, she gains a better sense of her true self and her sense of right and wrong. The new Ms. Marvel, also known as Kamala Khan, who first gained her own comic book series in February 2014 (after an appearance in Captain Marvel in August 2013), has many dualities within her identity. First of all, she has the typical teenage girl issue of trying to please both her family and peers; her identity as a Pakistani American girl intensifies this challenge. She tries to find a balance between respecting her family’s cultural values and fitting in with American teenagers. Kamala soon discovers that she has a larger destiny awaiting her. 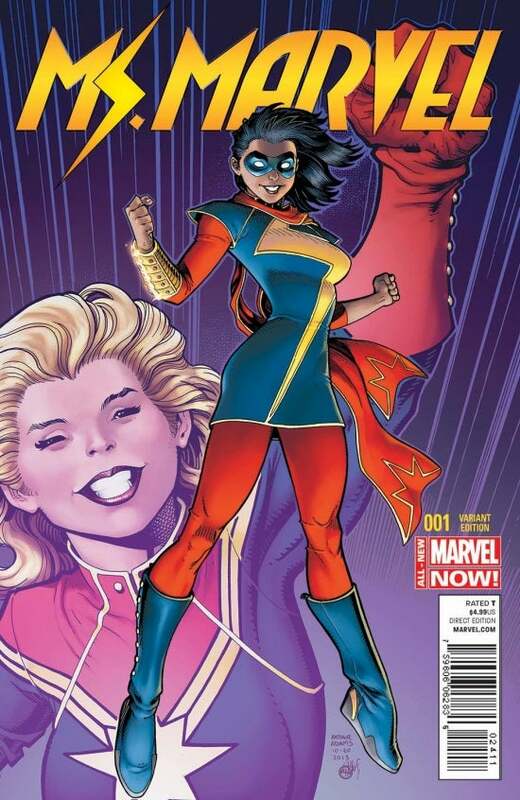 At the end of the first volume, Kamala’s transformation into a superhero begins, and Captain America, Iron Man, and Captain Marvel come to assist with the transition. 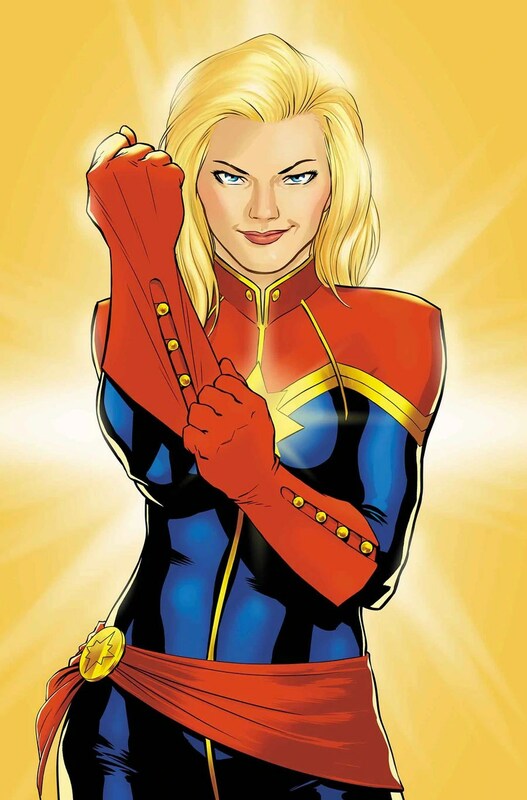 Captain Marvel warns, her, though, “it’s not going to turn out the way you think.” In other words, sometimes, having superpowers is a little bit more than one bargained for. In my opinion, Kamala’s story is a good example of how minority women are gaining more of a stronghold in leadership roles, especially in stories for young people and in the genres of science fiction, fantasy, and comics/graphica. Since these genres are sometimes marginalized due to readers not viewing them as serious literature, it seems almost fitting that these stories are the places for female protagonists and minority women to surface as prominent characters. Kamala is among the first minority teenage female superheroes to have a lead role in a comic, and hopefully, more will follow. Her story is one worthy of study in classrooms, as her struggles are relatable, and her perseverance makes her a strong role model for teenagers. It’s interesting that Kamala’s commentary reflects on other people’s expectation not only on the numerical age of female superheroes, but also of their physical appearance. However, she begins to realize that even as a teenager, she has agency and can make changes in her life and in how other people perceive her. In volume 4 of Ms. Marvel, Kamala’s friend Bruce encourages her by saying, “Who cares what people expect? Maybe they expect some perfect blonde, what I need—I mean, what we need—is you.” Only gradually does Kamala realize that she should be her own kind of superhero, rather than the one people are expecting. Therefore, she gains a greater respect for her true identity. Kamala still retains her superhero powers, but she stops shapeshifting into Carol Danvers (Captain Marvel). Instead, she keeps her superhero costume on, yet remains in her true bodily form. Young women often feel that they have to fit a certain mold to please others, to get what they want out of life, and to succeed. However, Kamala realizes that she can help others the most simply by being herself and by fighting the battles she believes to be important. Kamala learns to fight against oppressive forces and to be authentic, both valuable lessons to teenage girls. I hope teachers will consider studying this comic in the classroom, in conjunction with other literature, to discuss the roles of women in society and the portrayal of female minority characters. Margaret Robbins is a second year doctoral student in the Language and Literacy Education department at the University of Georgia. She is a Graduate Assistant for both the Red Clay Writing Project and the English Education department. She also has done work with the Kennesaw Mountain Writing Project. Margaret taught high school English for three years and middle school reading and language arts for seven years. Currently, she is the Poetry and Arts Editor for the Journal of Language and Literacy Education. She has been an avid reader of YA literature for many years, and her research interests include children’s/YA literature, multicultural education, critical literacy, critical media literacy, and pop culture.